Register Log In ECN Forum Forums General Discussion Area Pull out fuse panel? 1. The photo below is a fuse panelboard. 2. Replacement fuses are common and obtainable. 3. The panelboard is safe. That is a cartridge fuse panel using pull out fuse holders. The fuses are available and usually in a lot of values you can't find in a breaker but they may not be cheap. Safety really depends on the condition of the panelboard. If everything is in good condition some say fuses are safer than breakers but not as convenient. If it's in good shape, leave it alone, as Greg said. A little sanding, and a coat of paint on the cover maybe? I have a few friends who worked for Bussmann, and they have always professed what Greg added that fuses are superior to CBs. They had some great videos to sway people, specially for fault conditions. My belief is that fuses are best for short circuit protection, but not so good for overload protection. Conversely circuit breakers are best at overload protection. It is pretty much impossible to have a fuse fail "closed" and when they change value, it tends to be toward a lower rating. We used fuses a lot in the computer business because they offered better protection for the hardware. You can also get them in just about any rating you like. The main flaw is it is too easy to replace a fuse with a larger size than the specifications. I had a problem with an installation many years ago and there was nothing I could do about it. This was a big rest stop on the interstate with toaster wire heat along with a lot of other load. They served it from a 400a fused service disconnect and the feeder to the building where they had a 400a panel was fed by 300 Kcmil aluminum. I said the wire was too small and they said they only had 225a fuses in the service disconnect and everything was legal. 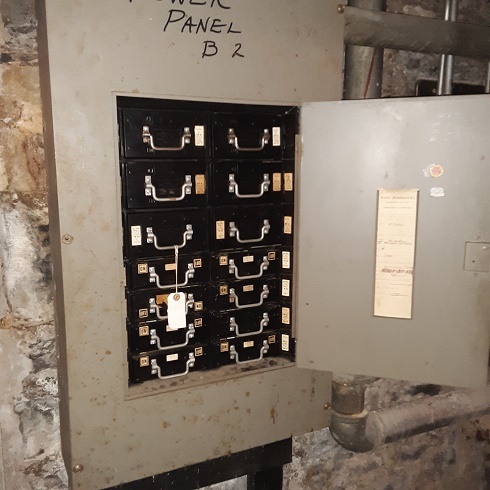 They also said the 400a breaker in the panel was just the building disconnect and the up stream fuses protected the feeder. After looking it up, they are right and I even talked to other inspectors. You have to inspect what is there, not the dumbest thing someone might do later. I wrote a proposal, more to get the sense of NFPA than to actually get a code change and their attitude was the same. We have to trust that there will be qualified professionals working on these things and the fuses installed determine the minimum ampacity of conductors, not the biggest standard fuse that will fit. My problem is this will be serviced by DOT workers, not electricians. They will use what they have on the truck. I did make them label the disconnect "225a fuses only" since they said that was all they needed. What does it look like if you take the dead-front off? Things like this tend to hide "secrets"
It was installed in the early 1950's. When 100A was a big service. Spares sitting behind the meter, but never had to use them. The "Shop Rite" sticker is priceless. Looks like PSE&G original equipment. It had a 200a main breaker but the panelboard was 2 pullouts and ~20 plug fuses. One of the pullouts was a dryer and I used the other one to feed a sub panel in the garage.